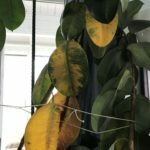 I have an 8-foot tall rubber tree plant and I am not quite sure on how to trim it. It is very healthy and has ten leaves on it. I do not want to make it unhealthy by over trimming.